Compact Label Printer/Applicator suits low-throughput jobs. With 4 in. max print width and 10 ips print speed, 5410 Mini integrates RFID-Ready 110 Xi4 printer into rugged, industrial frame that measures 18 x 12.5 in. Unit features 10 in. OD label roll and can print on thermal transfer or direct thermal label stock at resolutions to 203 or 300 dpi. While uniwall design minimizes tracking issues, silk-screened media paths shorten downtime. Other features include 300 darkness settings, user displays, and dynamic rewind tension control. EXPORT, PA - FOX IV Technologies announces the worldwide release of another game-changing system. The 5410 Mini Label Printer Applicator integrates Zebra's RFID-Ready 110 Xi4 printer into a rugged, industrial frame that measures a scant 18" long by 12.5" deep. The latest addition to FOX IV's expansive line of Zebra-Based Print and Apply systems features a 10" OD label roll and maintains most of the features of the full-sized unit while providing a cost-effective, space-saving solution for low-throughput applications. Operators will appreciate the 5410 Mini's popular Uniwall design to reduce tracking issues, silk-screened media paths to shorten downtime, swing-away cylinders for easy access, intuitive user displays and dynamic rewind tension control. A wide variety of print options highlight a list of print features including a 32 bit 133 MHz RISC print processor for faster throughput and processing, 16 MB SDRAM memory for printing longer label formats, up to 256 MB of CompactFlash® memory for added label format and font storage, 8 MB of non-volatile Flash memory and 300 unique darkness settings. FOX IV's global reputation for dependable labeling equipment meets Zebra's global reputation for speed, quality and durability in the 5410 Mini. The unit can print on either thermal transfer or direct thermal label stock at 203 or 300 dpi, has a maximum print width of 4" (102 mm) and is capable of high-quality printing at speeds up to 10 ips. FOX IV's 5400 Series of Zebra-Based Label Printer Applicators is one of the most versatile and popular product families in the market. The full-sized 5410 Standard is an industrial workhorse complete with FOX IV's standard 16-inch OD label roll - almost twice as much media capacity as a 12-inch label roll. 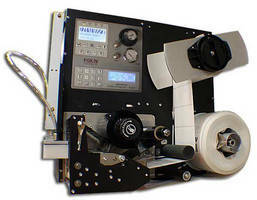 The 5470 Label Printer Applicator is capable of printing labels up to 6.6" wide at speeds up to 12 ips. The 5422 Label Printer Applicator (12-inch OD standard) features the world's largest label web and prints labels up to 8.5" x 14" at speeds up to 10 ips. RFID and RFID-Ready capabilities are available on some models. FOX IV Technologies, Inc., offers a full line of label printers and applicators, ribbons, labels, enclosures, printing supplies and services, material handling equipment and software solutions in order to provide fully integrated turnkey automated identification systems. The company integrates more than 25 OEM print modules and tabletop printers into rugged label printer applicators capable of operating 24/7 in all types of manufacturing environments. Known internationally for innovative designs and customized solutions, FOX IV is located approximately 20 miles east of Pittsburgh, PA.